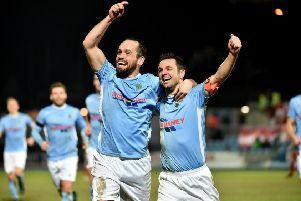 Ports fans will be hoping to see Peter McMahon (left) and Michael Gault celebrate at Seaview against Crusaders. Pic by PressEye Ltd.
A number of supporters’ clubs will be running transport tonight (Friday) to Seaview for Portadown’s Danske Bank Premiership game against Crusaders. OFFICIAL TRAVEL CLUB: Leaving Shamrock Park at 6.30 and JD Tipler’s at 6.45. EDEN REDS: Leaving Gary’s Bar at 6.30. RICHHILL REDS: Leaving the village square at 6.30 - with pick-up points planned for Armagh (6.15) and Portadown (6.45). SHAMROCK REDS: Leaving West Street at 6.15 and Shamrock Park at 6.30.